HyperV Technologies Corp., has started a crowd-funding campaign on the website Kickstarter to pay for the project, called a plasma jet thruster. Travel to the moon, asteroids, Mars and other nearby destinations could become more affordable if a Virginia-based company achieves its goal of building cheaper electric space propulsion. The firm, called HyperV Technologies Corp., has started a crowd-funding campaign on the website Kickstarter to pay for the project, called a plasma jet thruster. The 8-year-old company, which officials said collaborates with several United States laboratories in its research, has just two days left in the campaign to raise its goal of $69,000. "We believe the same plasma accelerator technology can be adapted ... thus opening the door to many new, exciting robotic and large-scale manned space missions," said Doug Witherspoon, HyperV's president, in a video on the Kickstarter campaign page. The video showed Witherspoon's team eagerly taking potential backers on a virtual tour of HyperV's 9,000-square-foot facility, as well as cracking engineering jokes and using whiteboards to explain how the plasma technology will work. Plasma propulsion uses a device that heats gas, accelerates it through a magnetic field, and then shoots it out the opposite end. Action, meet reaction. HyperV's plasma accelerators split the formation and acceleration stages into two sections inside the device. The company already has a "single-shot" design reportedly demonstrated at three annual meetings of the American Physical Society Division of Plasma Physics. Now, HyperV wants to build a test device that can repeat the shots at five pulses a second, and generate exhaust velocity of nearly 12.5 miles a second (20 km per second), while using only a kilowatt of power. The company did not disclose when it hopes to demonstrate the technology in space. "This is going to be a lot of work, but it's going to be a lot of fun for us, and hopefully for you too," Witherspoon said in the video, casually sprawling in a desk chair in HyperV's control facility. HyperV acknowledged it is entering a crowded field of competition. The history of plasma propulsion use in space dates back nearly five decades, with several countries working on their own versions of the technology. The United States Air Force followed suit in 1964 with its LES-6 communications satellite, built at the Massachusetts Institute of Technology. Plasma technology was also used in LES-8 and LES-9 in 1976. The Navy launched a trio of satellites in the 1980s (Novas 1, 2 and 3) that used plasma propulsion for drag corrections. 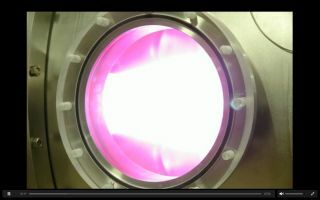 More recently, NASA's Glenn Research Center, the European Space Agency and MIT (among others) have been developing their own forms of plasma thrusters. Plasma propulsion is onboard NASA's Earth Observing-1 (EO-1) satellite, which is still in serviceafter launching in 2000. Still, HyperV maintained its approach and history will improve on the technology available. On its website, it listed research collaborators on past projects including the University of Chicago, Los Alamos National Laboratory and the University of Alabama in Huntsville. "Our advantages will be derived from a thruster that is less complex ... [and] which can use a variety of propellants including gases, inert plastics, and propellants derived from asteroids, Mars [and] the moon," read a statement on the company's Kickstarter page. "It will also be far cheaper to build, and can be more readily scaled to larger sizes and very high power levels than current electric propulsion systems." The Kickstarter project will only be funded if it receives at least $69,000 by Nov. 3. If not, none of the people who pledged financial support so far will be charged. For more information about the project, visit Hyper V's Kickstarter site. Editor's Note: This article was to updated to correct the target speeds of the plasma jet engine, which are 12.5 miles a second (20 km per second), not 12.5 miles an hour (20 km per hour), as originally stated.